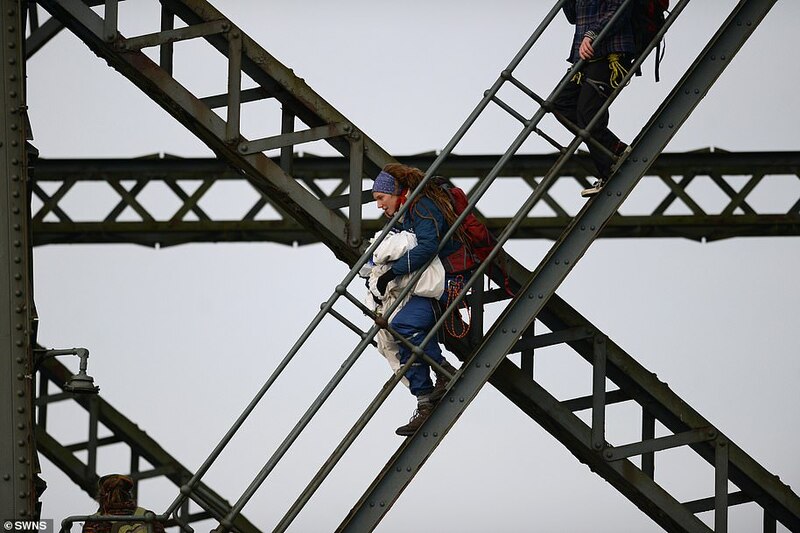 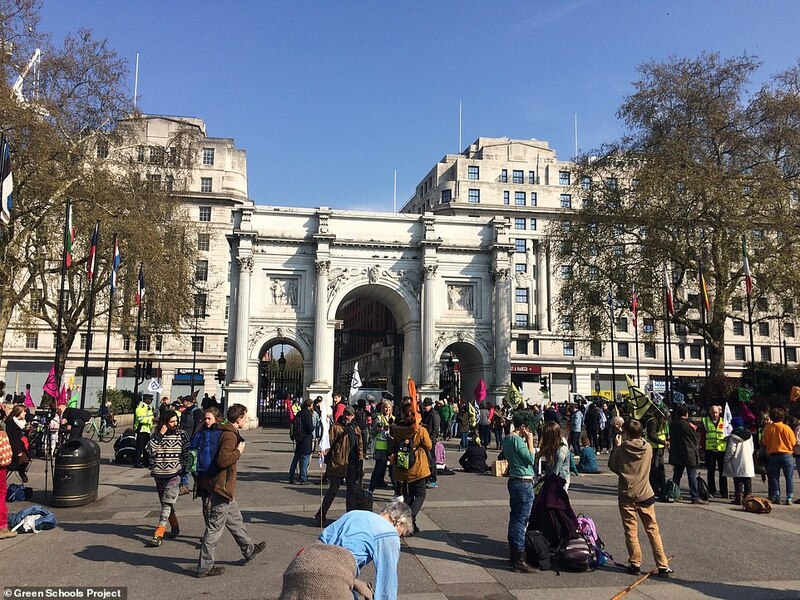 Commuters leaving London tonight face a chaotic journey home with thousands of climate change protesters blocking key transport hubs during a co-ordinated day of action at five landmarks. 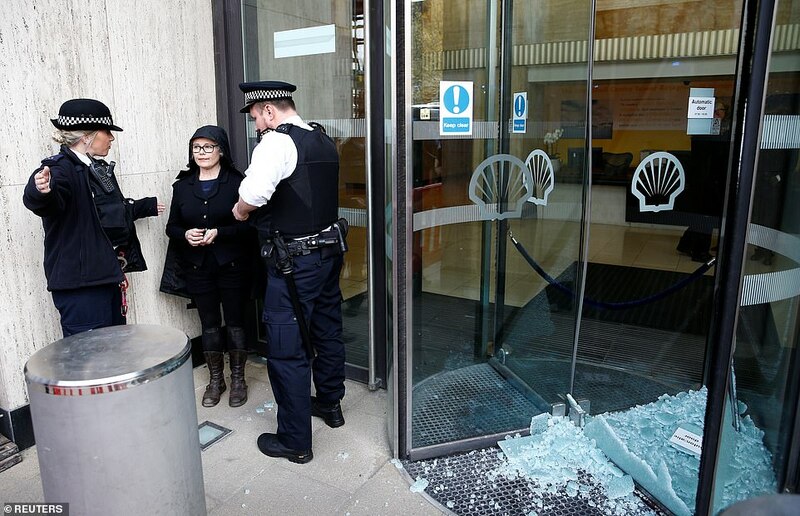 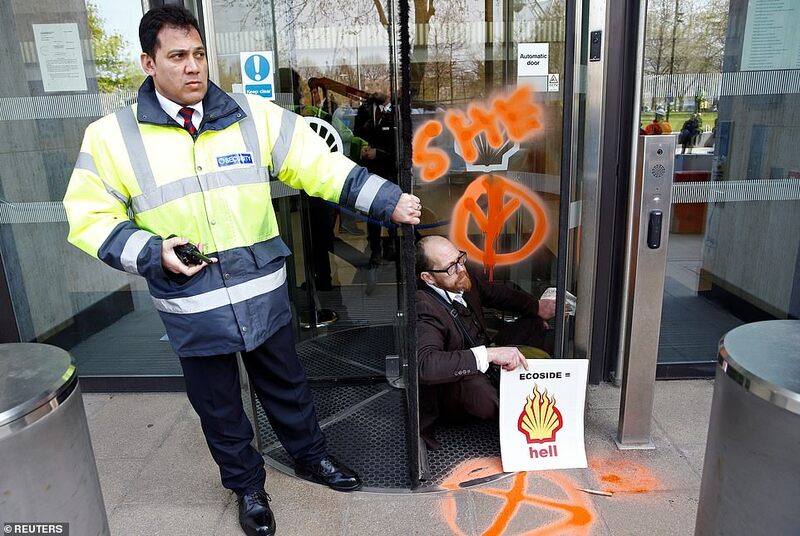 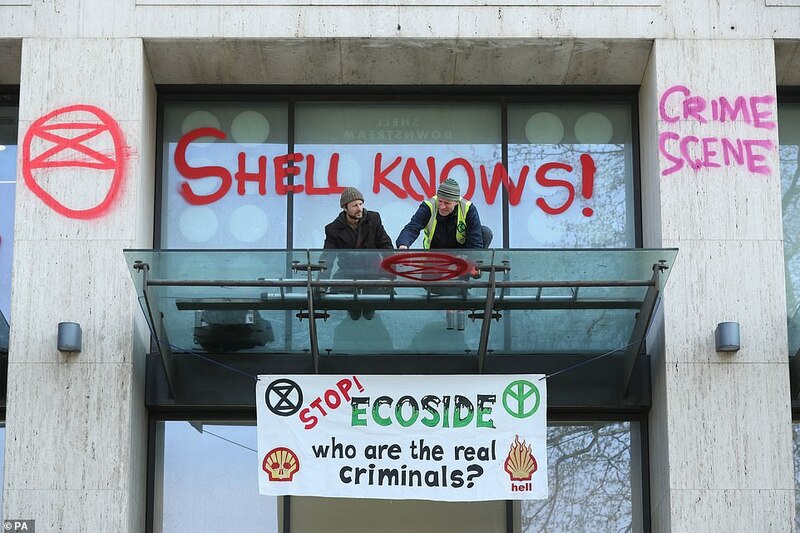 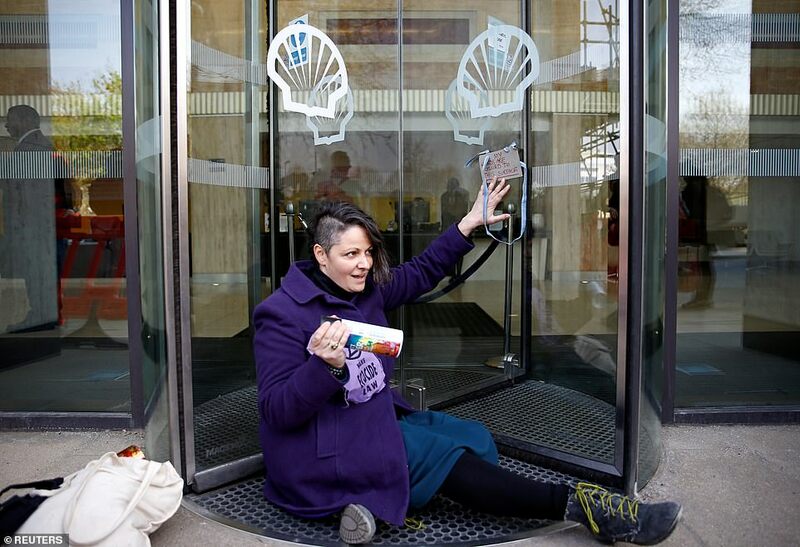 Some activists glued themselves to the windows and smashed glass revolving doors at Shell’s headquarters near Waterloo, while others spray-painted graffiti and hung banners on the building. 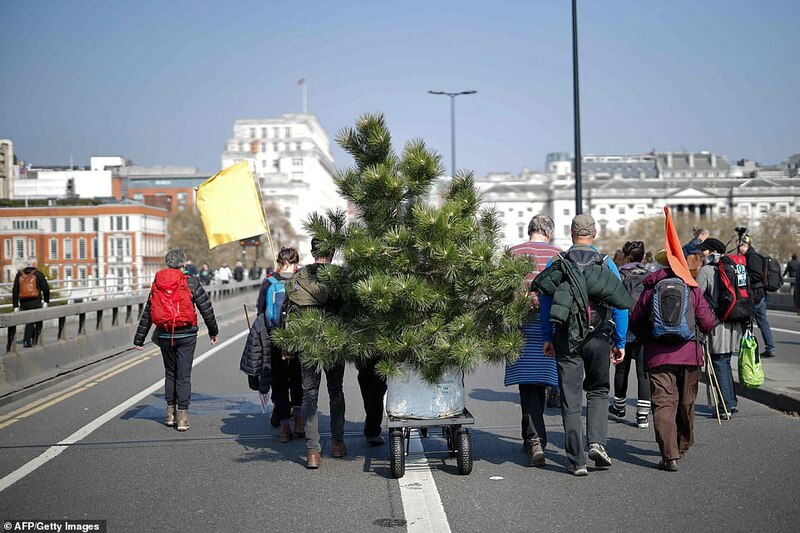 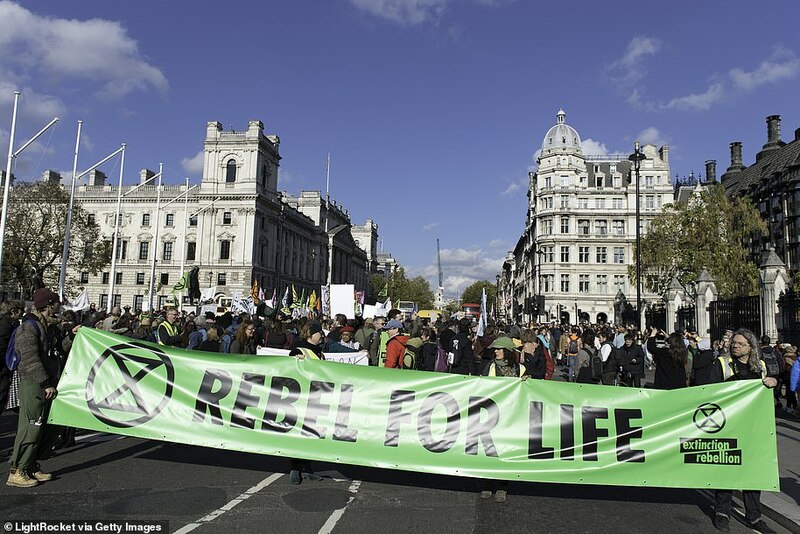 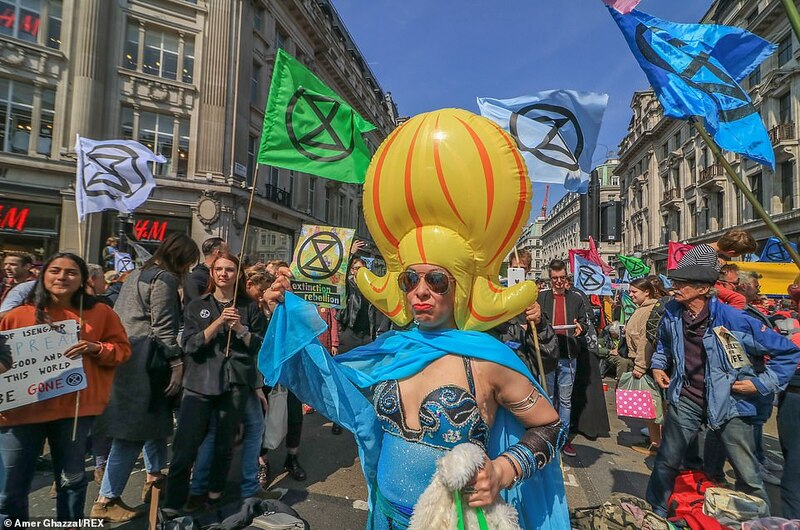 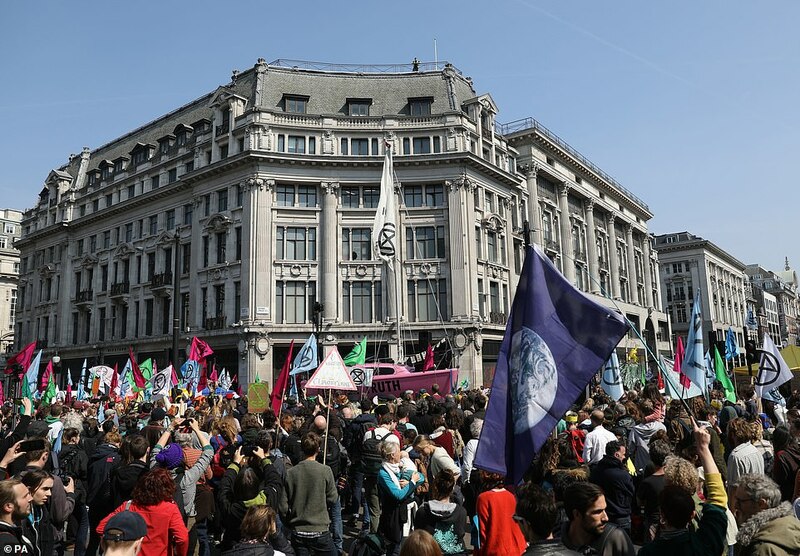 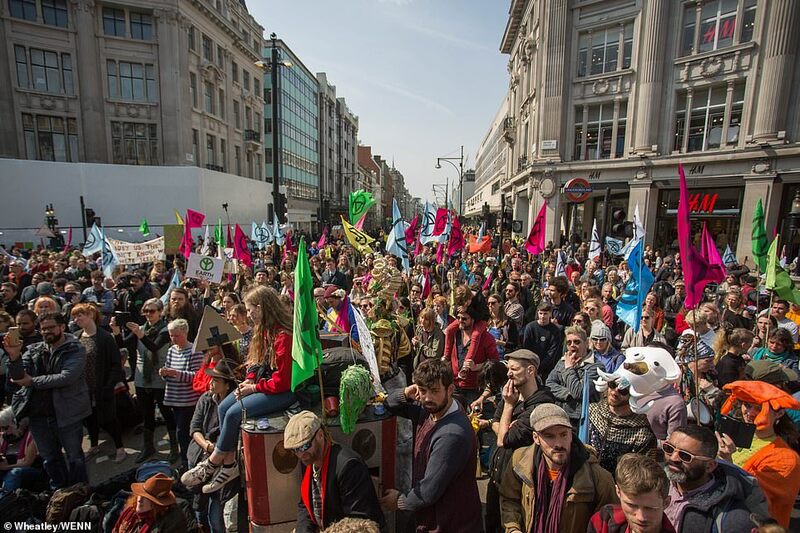 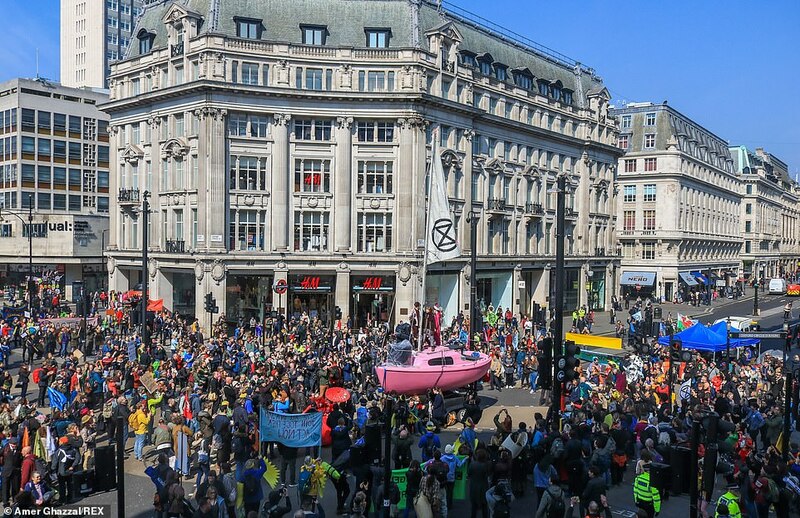 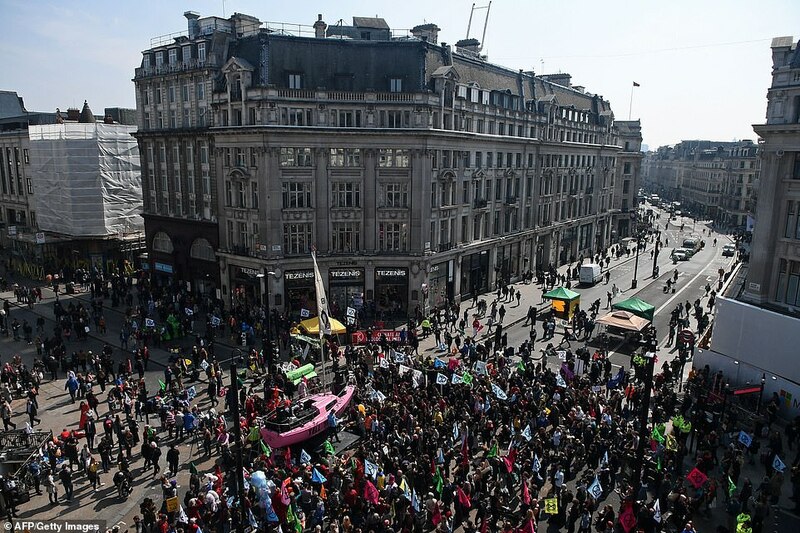 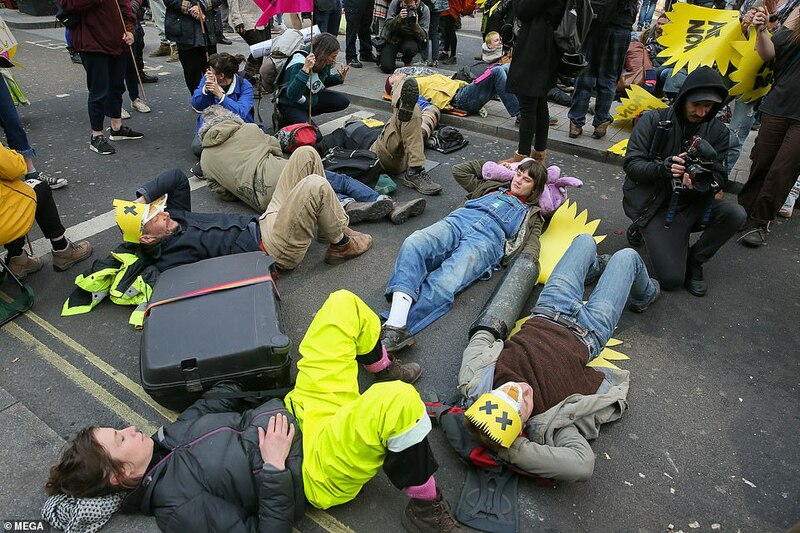 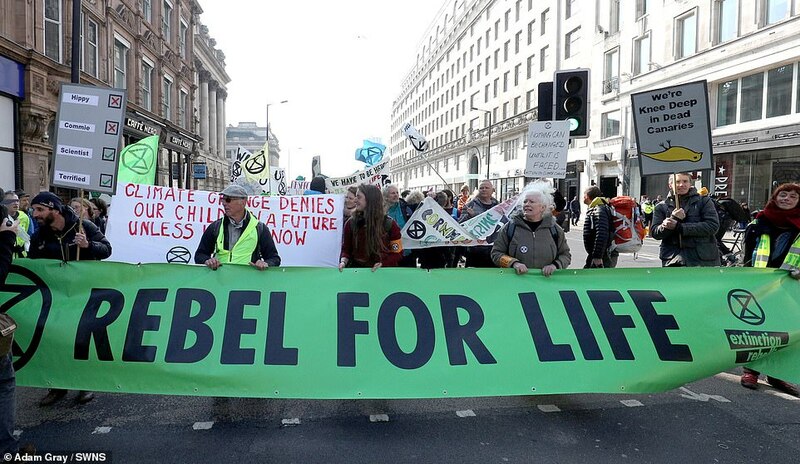 Workers returning home from areas around Waterloo Bridge, Oxford Circus, Marble Arch and Piccadilly Circus face being unable to get through by road to Underground stations thanks to the Extinction Rebellion protests. 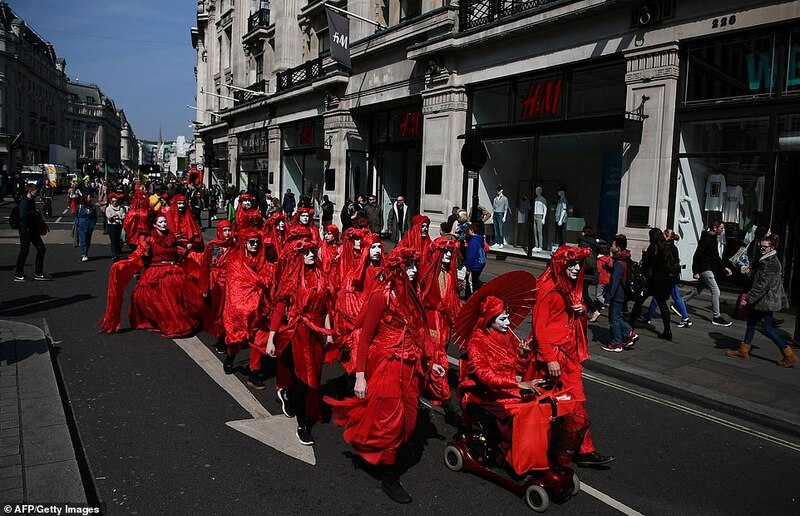 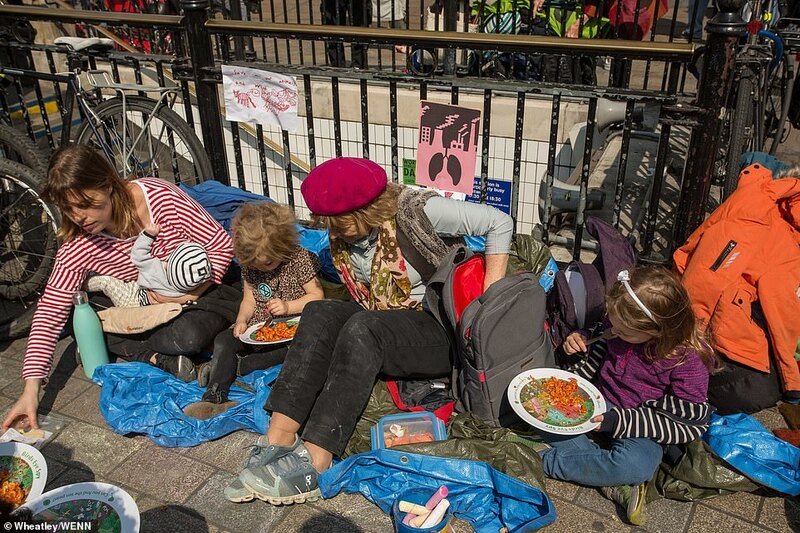 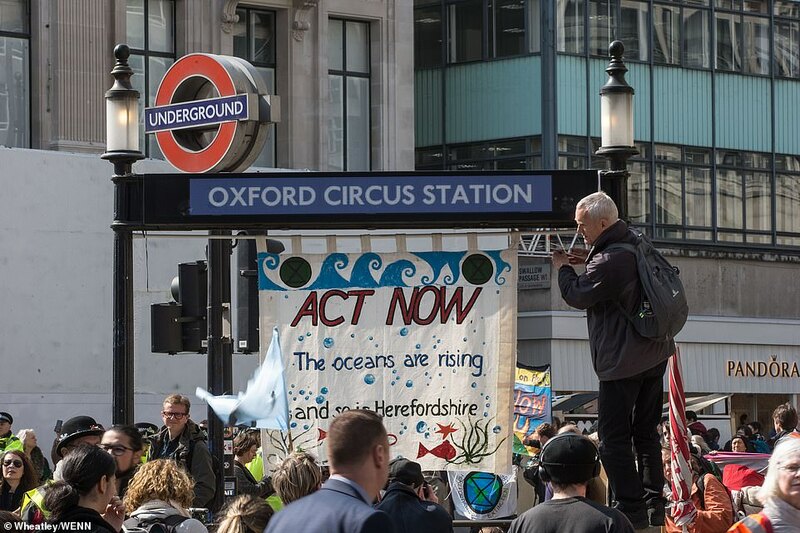 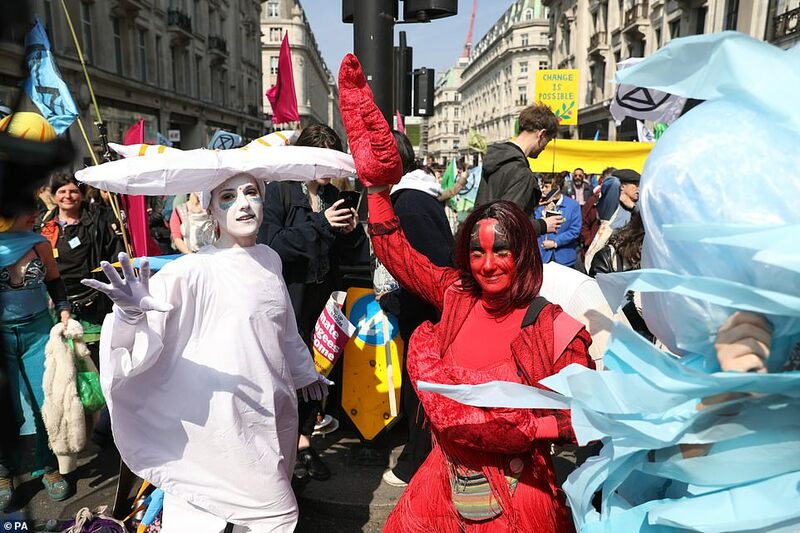 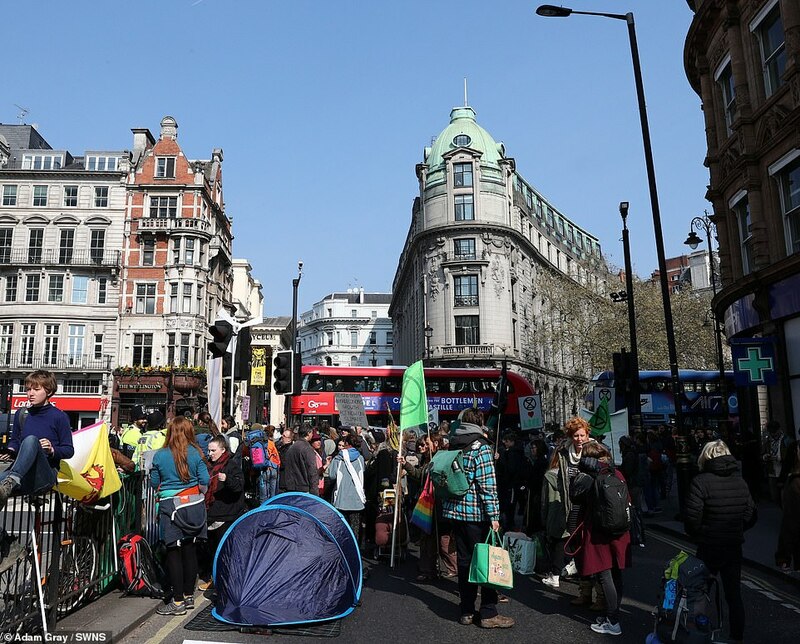 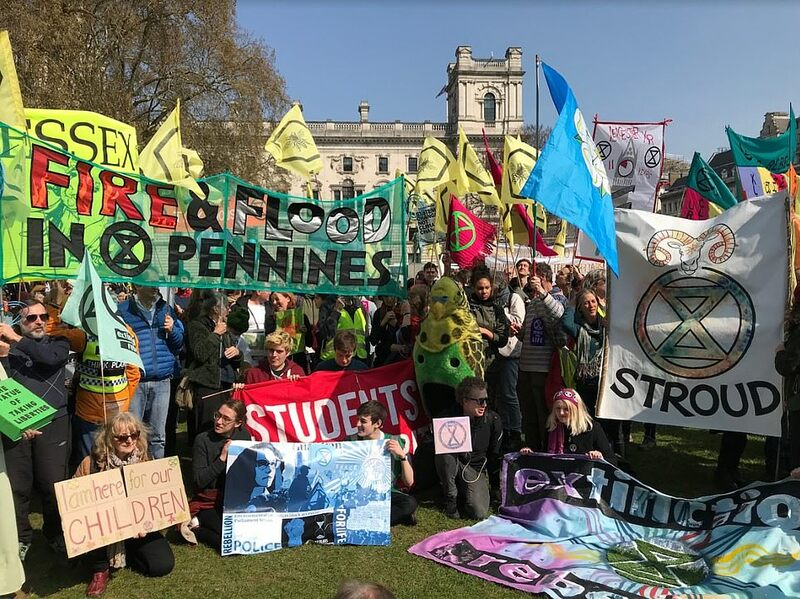 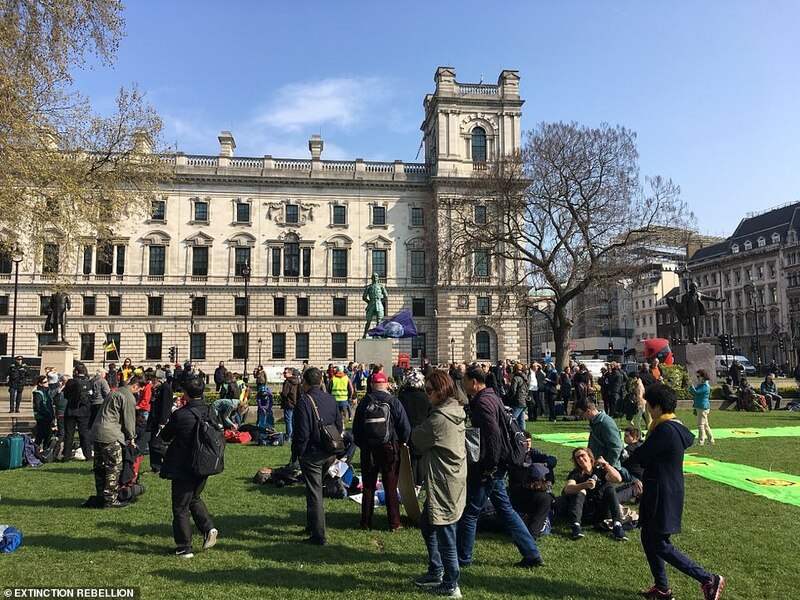 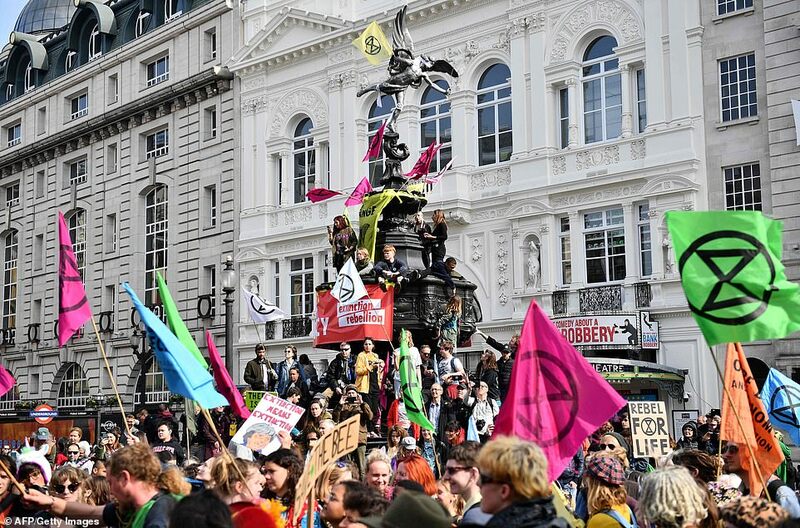 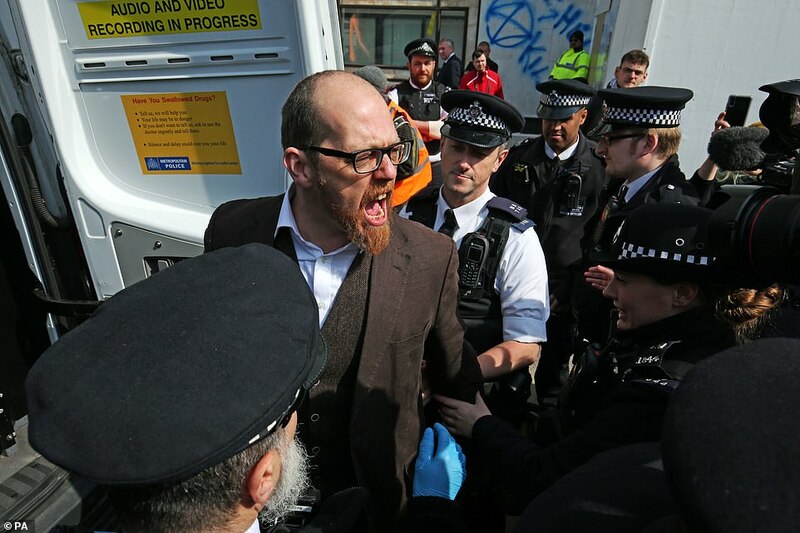 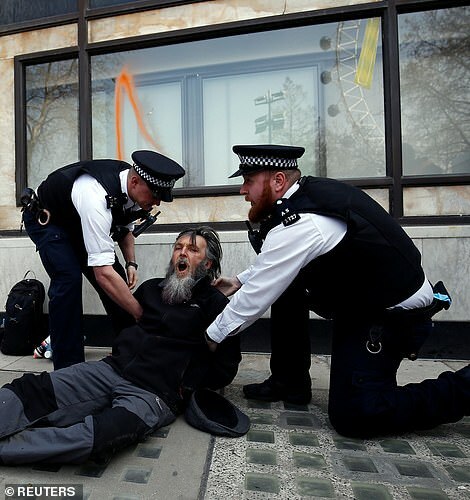 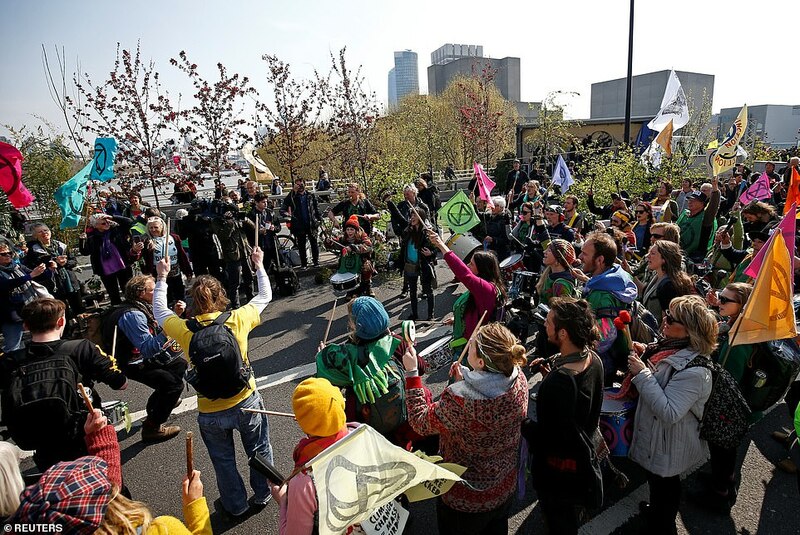 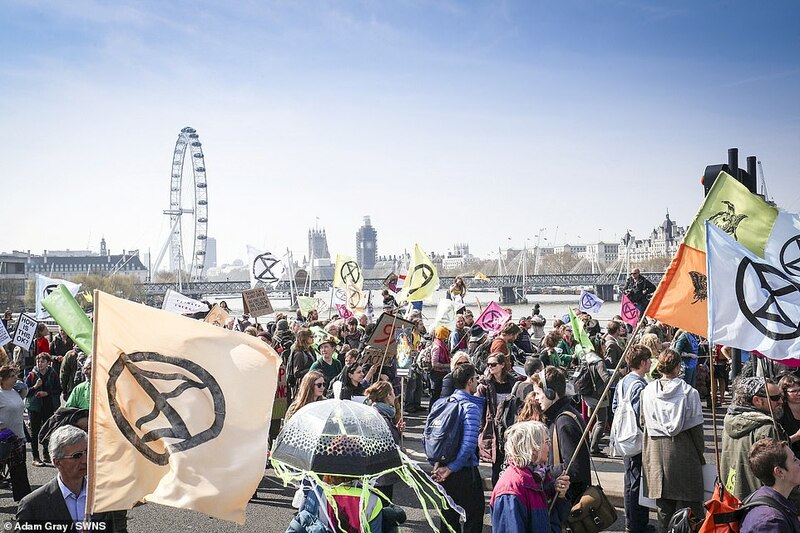 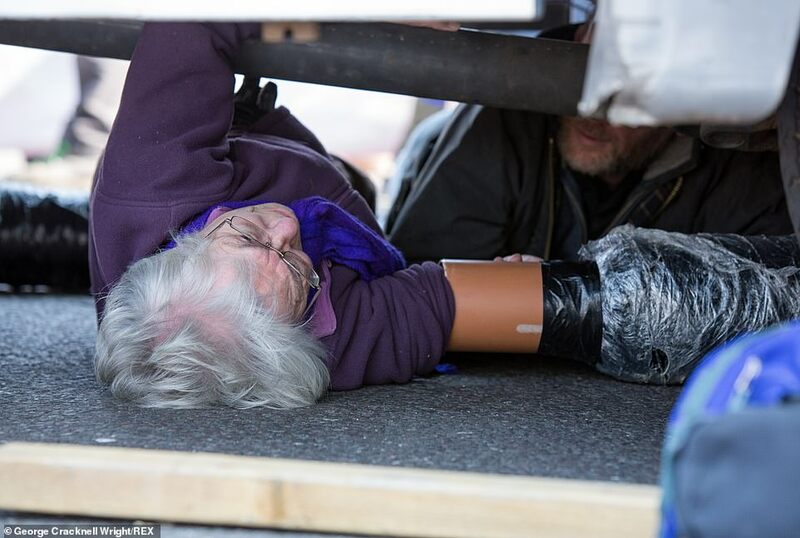 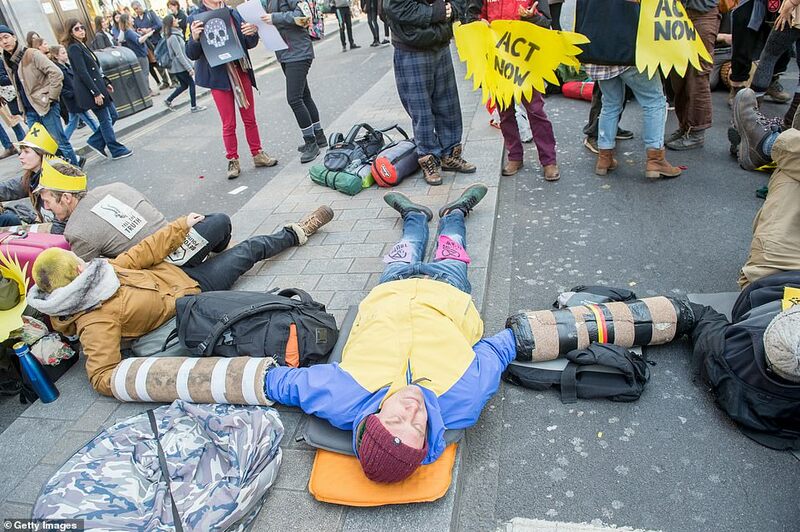 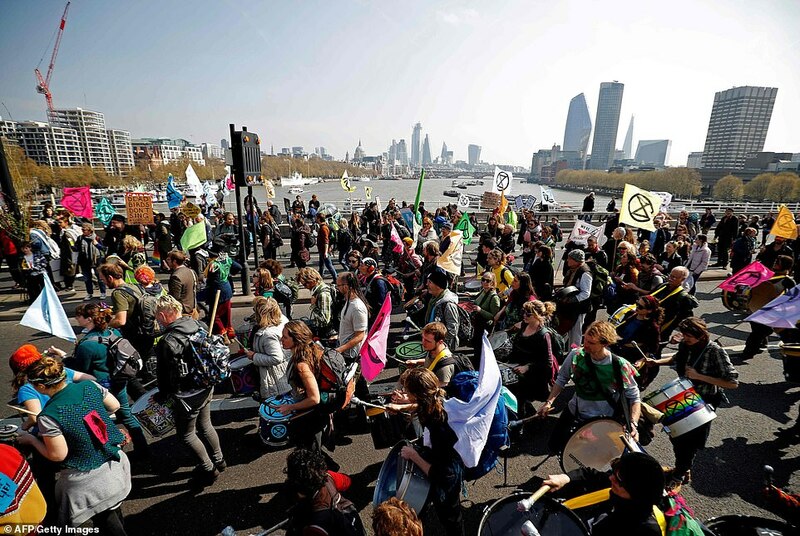 Activists are targeting five locations – the fifth being Parliament Square – as they demand the Government declare a climate emergency, but organisers warned they could be arrested for blocking traffic. 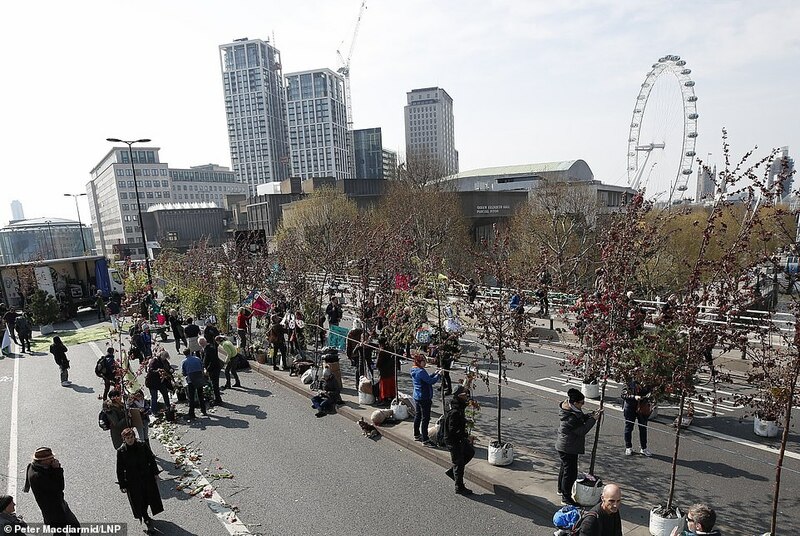 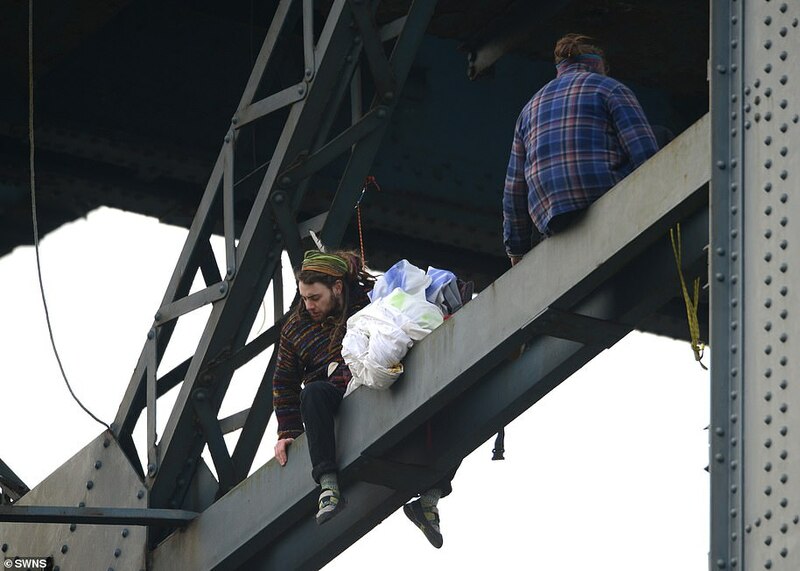 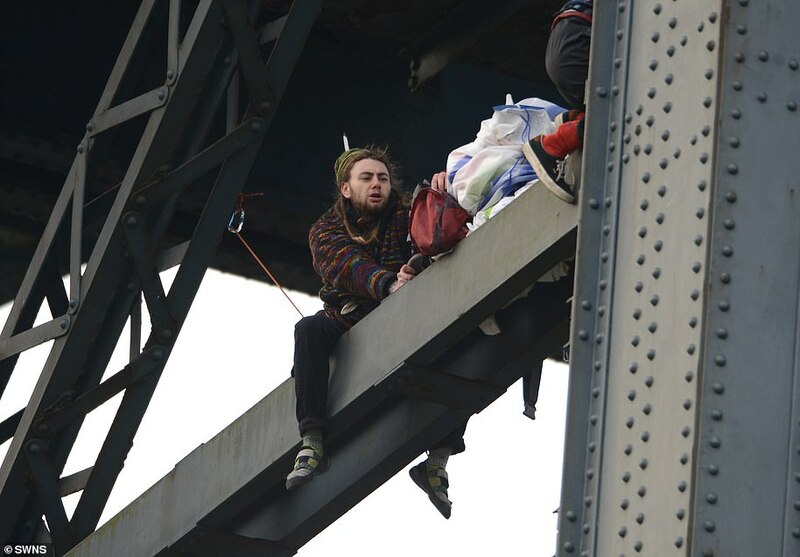 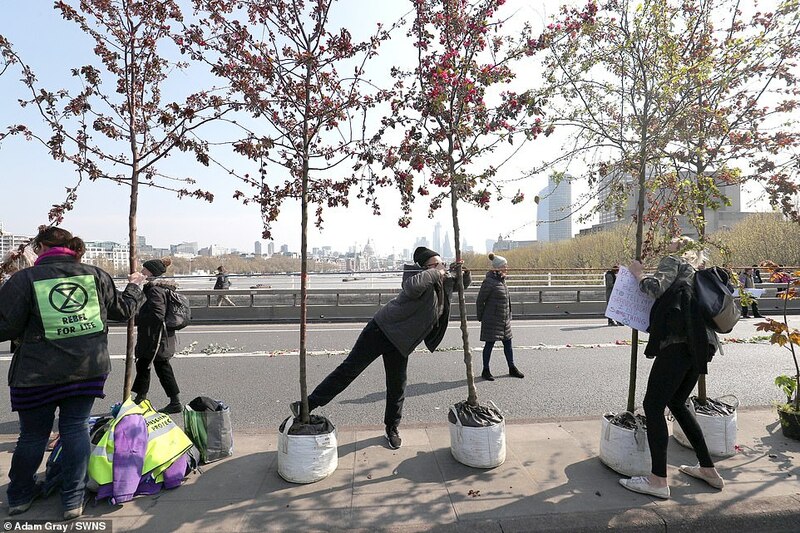 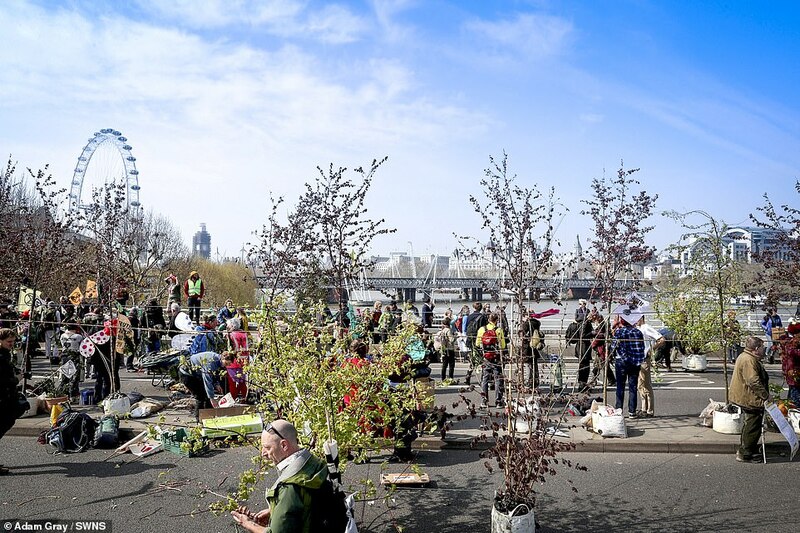 Protesters are holding people’s assemblies, performances, talks and workshops – with a colourful display of flags bringing normally busy routes to a standstill, and trees placed on Waterloo Bridge making it a ‘Garden Bridge’. 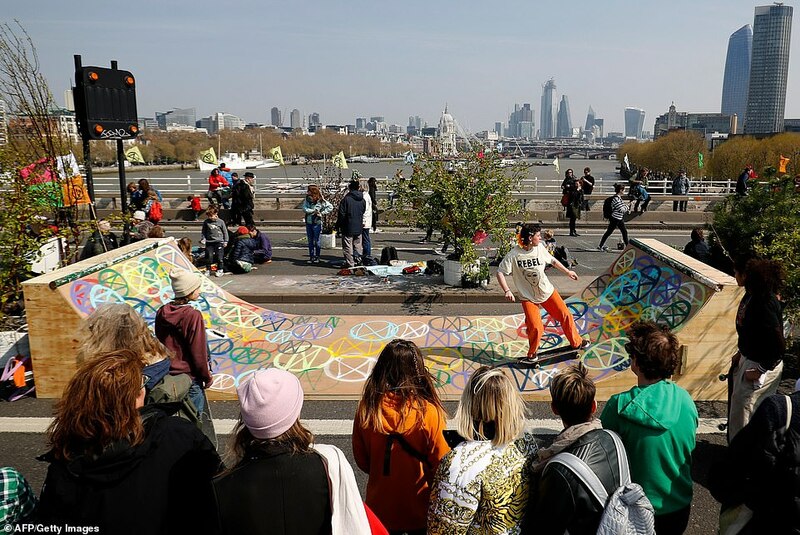 Skateboarders replaced cars and lorries on Waterloo Bridge, with police saying there were no plans to move protesters on – but indicated that the response might have changed if there were a major disruption at rush-hour. 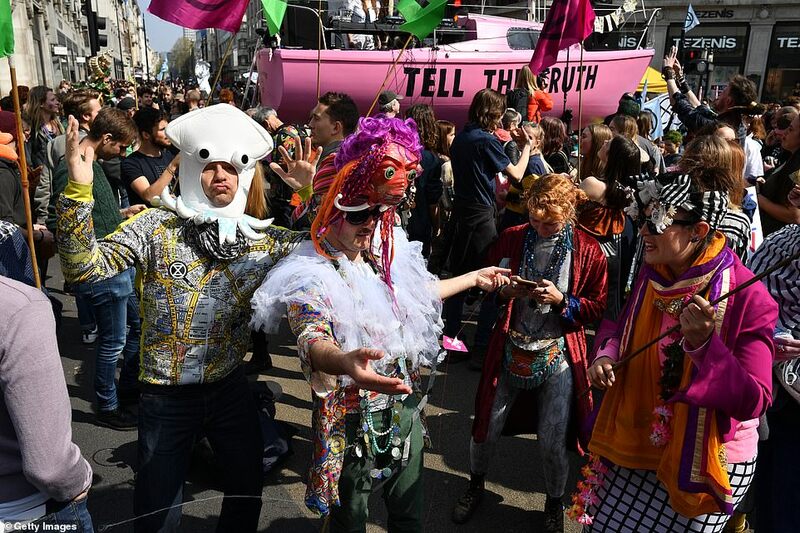 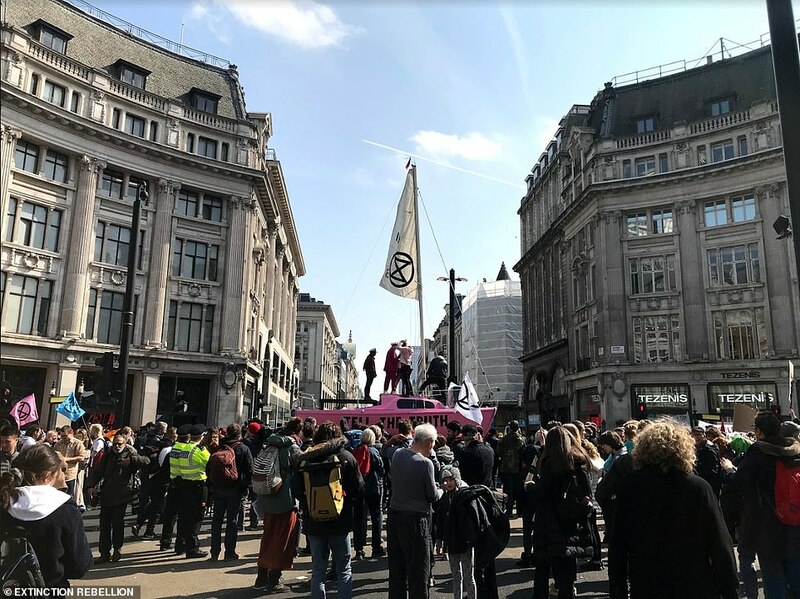 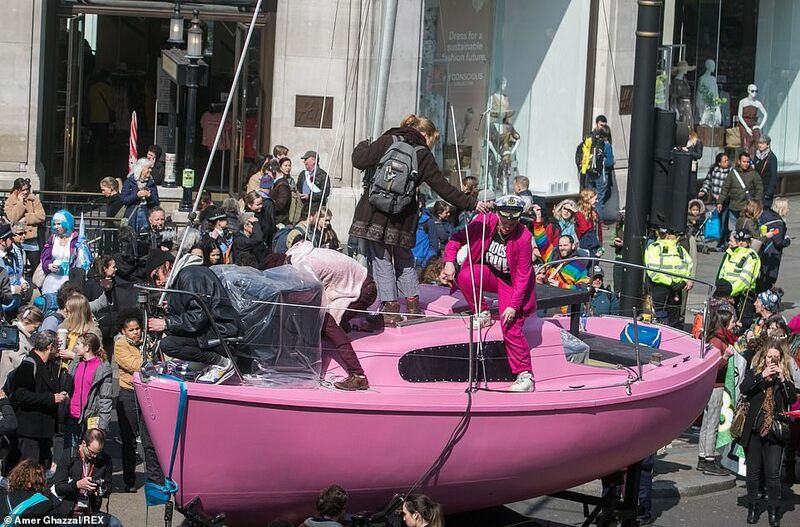 Hundreds of people gathered outside Oxford Circus Tube station around a pink boat with the words ‘tell the truth’ printed on it, where some used makeshift devices to lock their arms together. 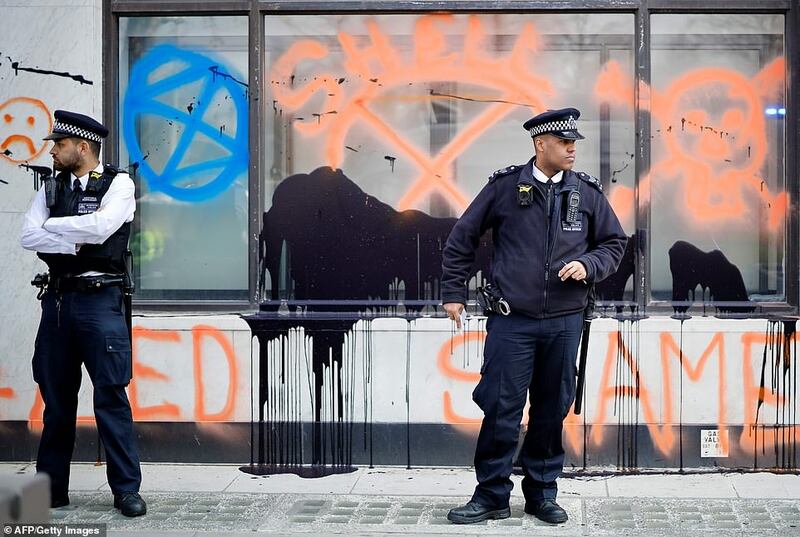 Amid a relatively small police presence today, Scotland Yard said they have ‘appropriate policing plans’ in place and officers will be used from across the force ‘to support the public order operation during the coming weeks’. 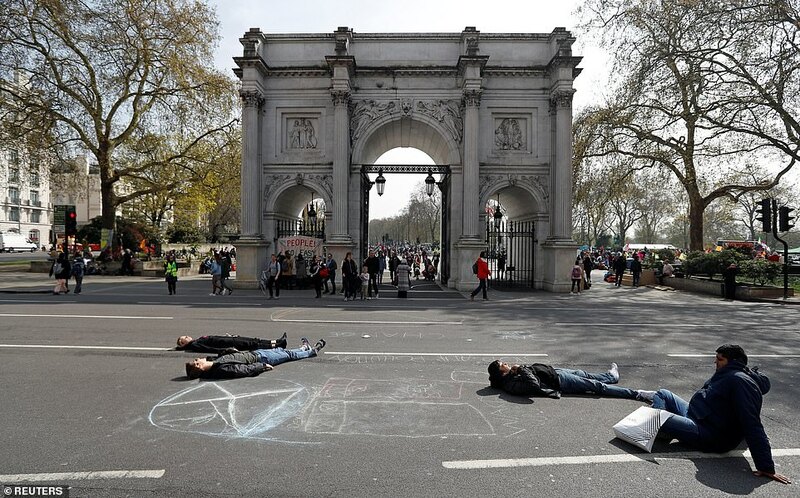 They say they will continue to block key roads in London for weeks and ‘escalate civil disobedience’ if their demands are not met. 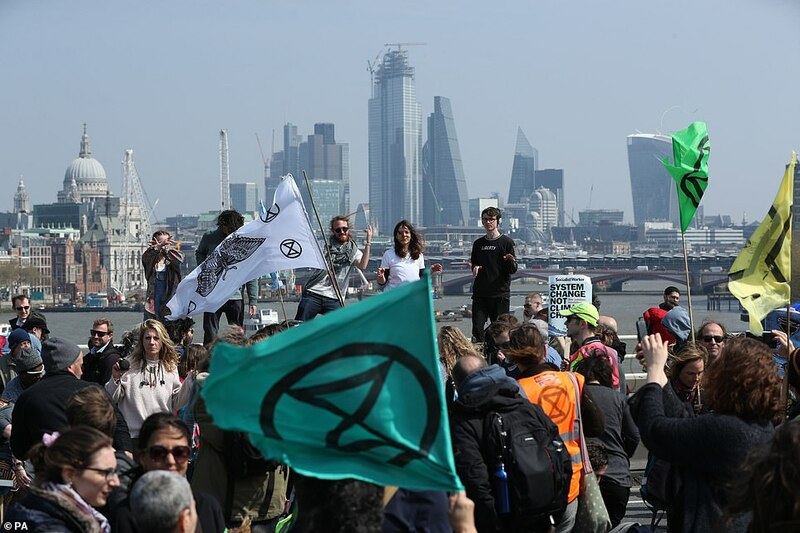 The first stage this morning saw protesters take over Waterloo Bridge from 10am. 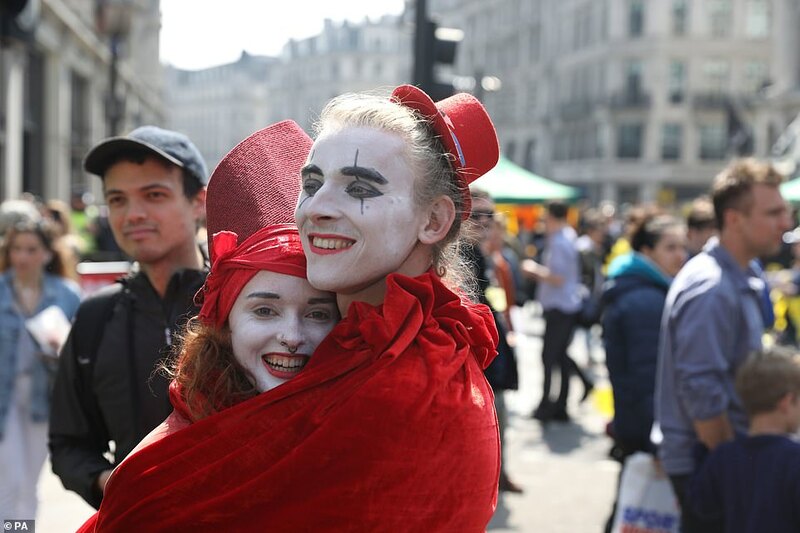 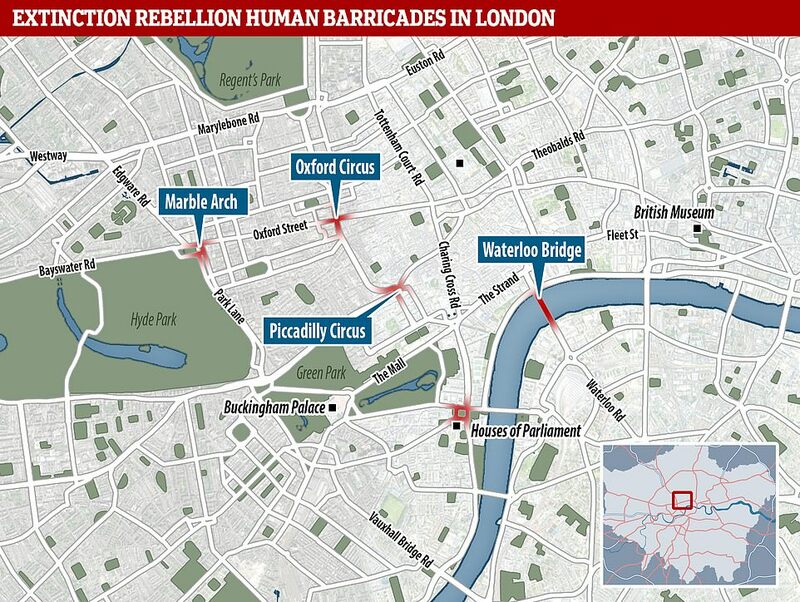 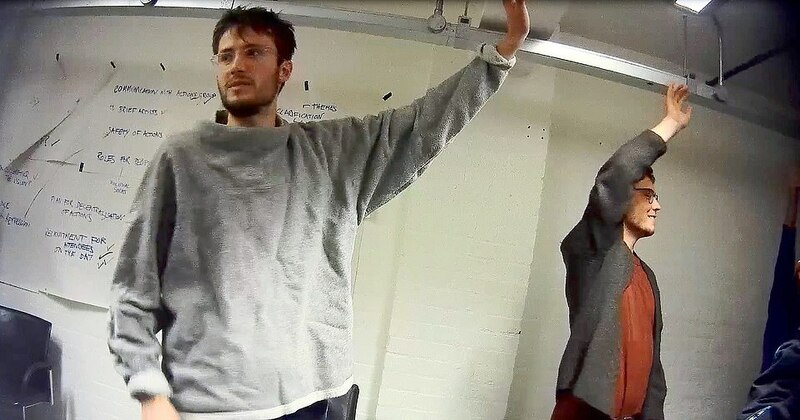 The next part of their global ‘Rebellion Week’ saw human barricades formed at Marble Arch, Oxford Circus, Parliament Square and Piccadilly Circus. 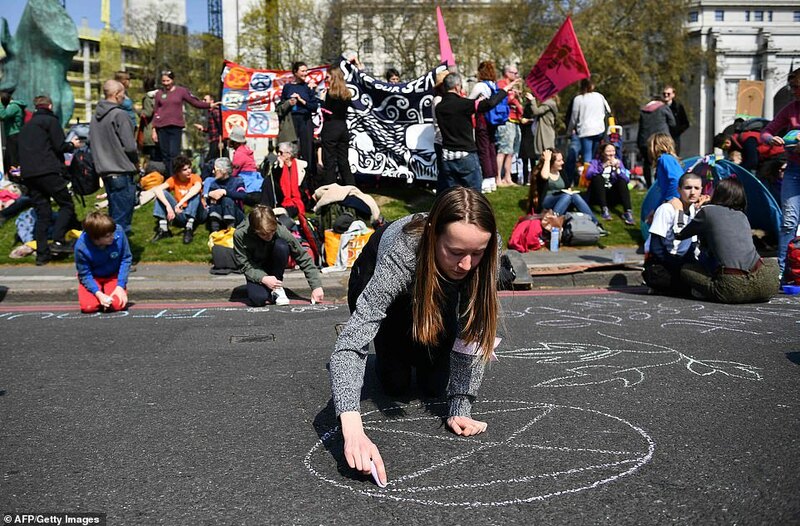 Protester Olivia Evershed, 23, said: ‘I hope that it’s really going to bring awareness about the emergency crisis that we are in, and encourage the Government to act. 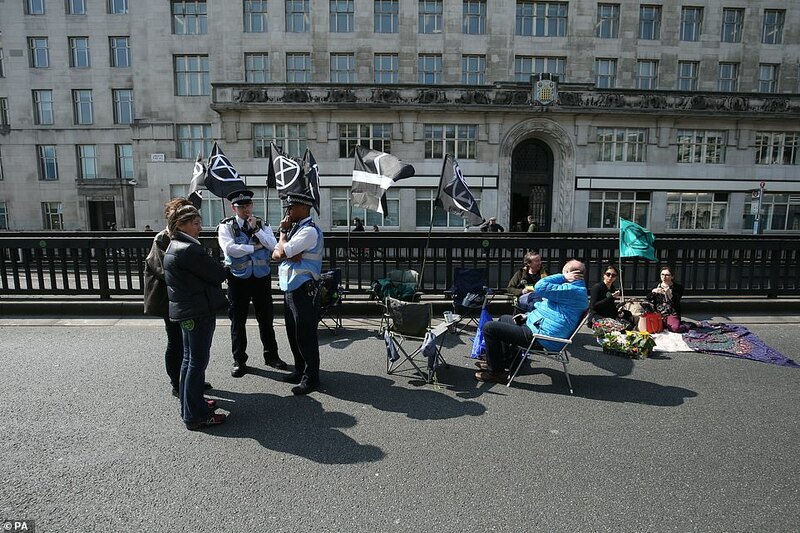 Laura Sorensen, a retired teacher from Somerset, was among the protesters on Waterloo Bridge. 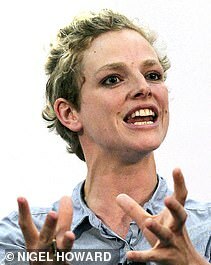 She told the Guardian: ‘I am so worried about what’s happening to the planet. 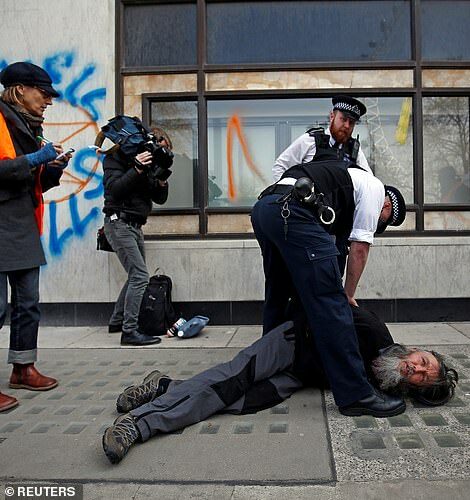 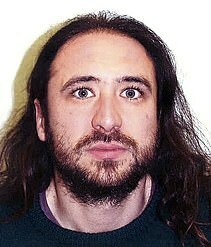 We are on a knife-edge now. 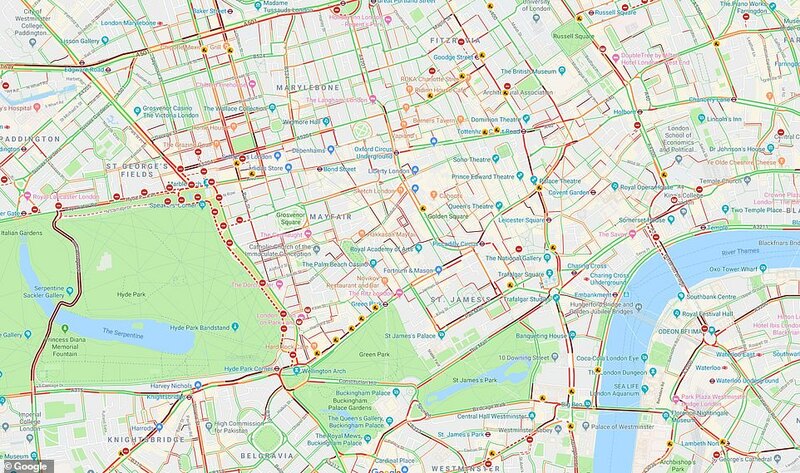 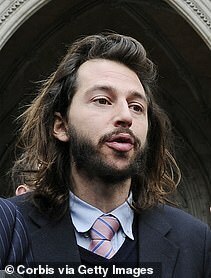 A TfL spokesman said: ‘The safety of our customers and staff is our number one priority and we’re working closely with the police to manage the impact on London’s transport network. 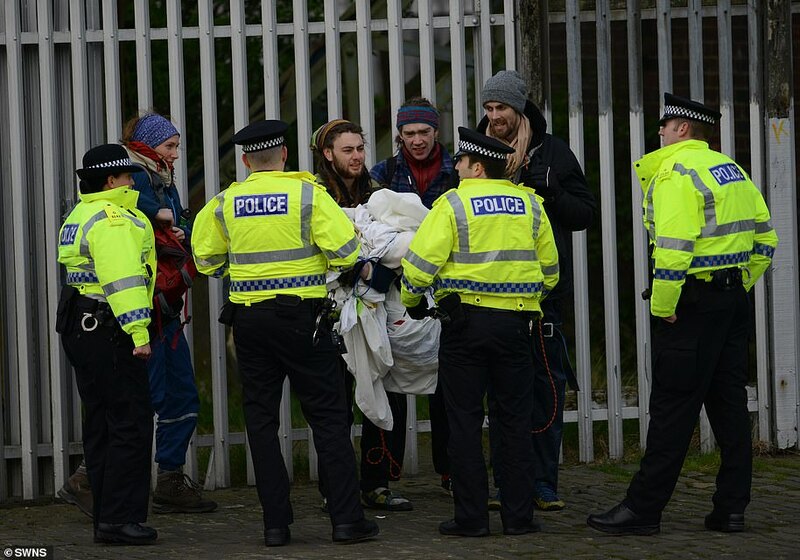 But police said no arrests were made overnight after earlier explaining their operational response to camping ‘would be dependent on what if any other issues might be ongoing at the time’. 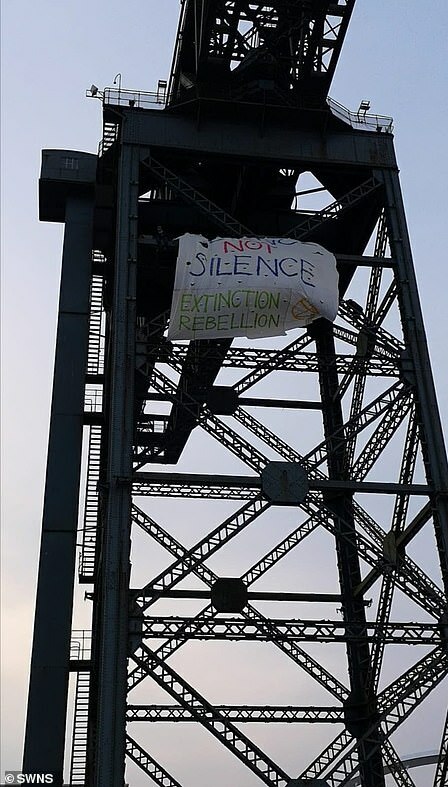 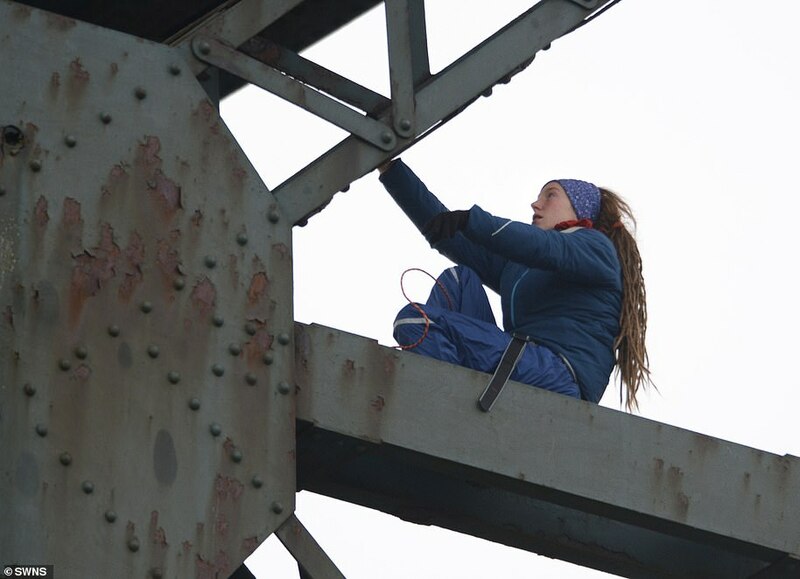 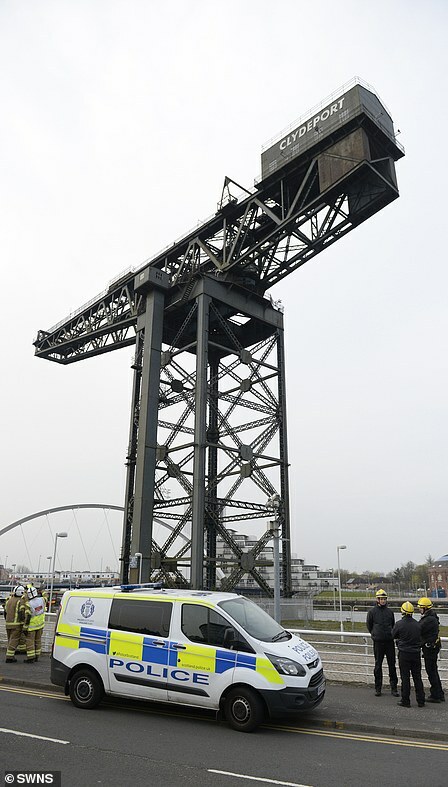 Today, members of Extinction Rebellion Scotland climbed the crane and hung a banner reading ‘science not silence’, at Pacific Quay. 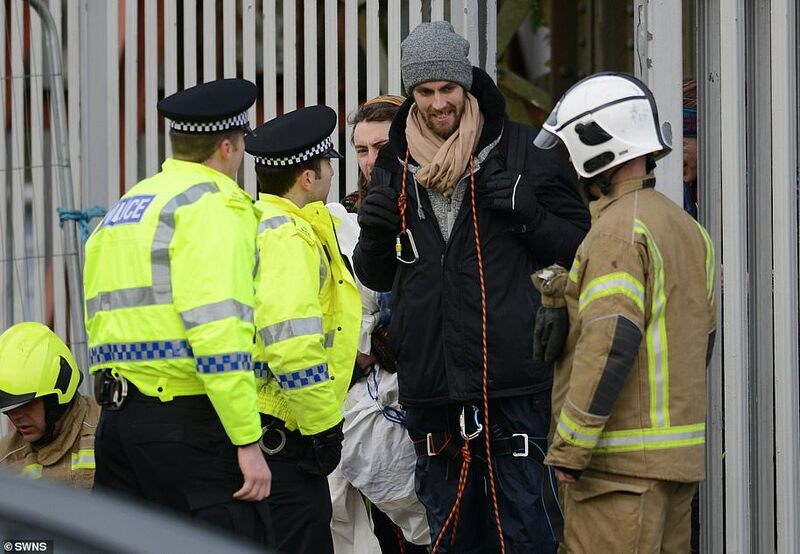 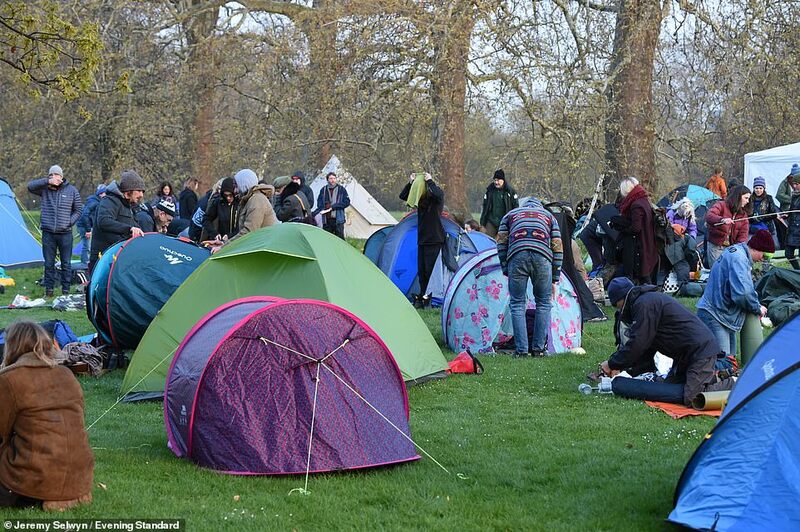 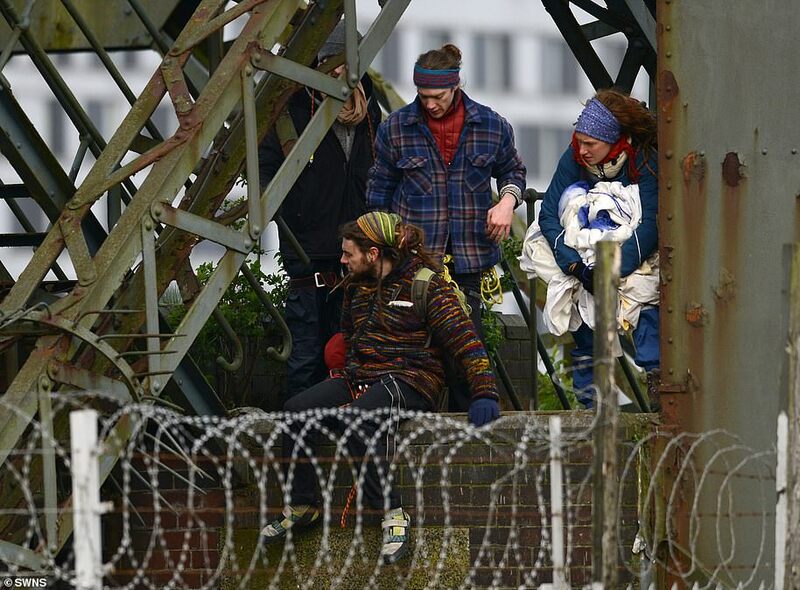 Police arrived at the site at around 7am and removed the campaigners, although no arrests were made. 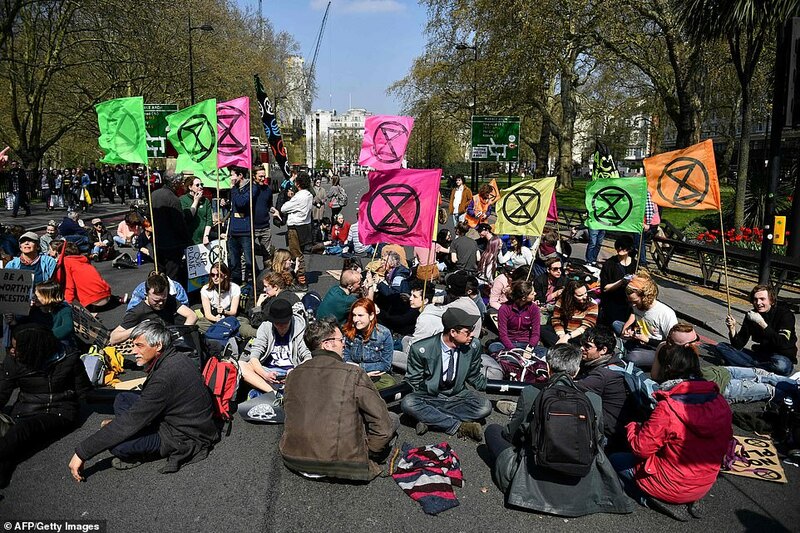 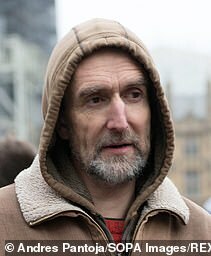 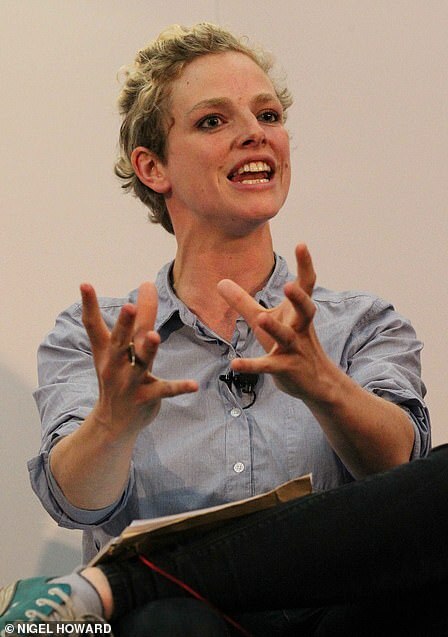 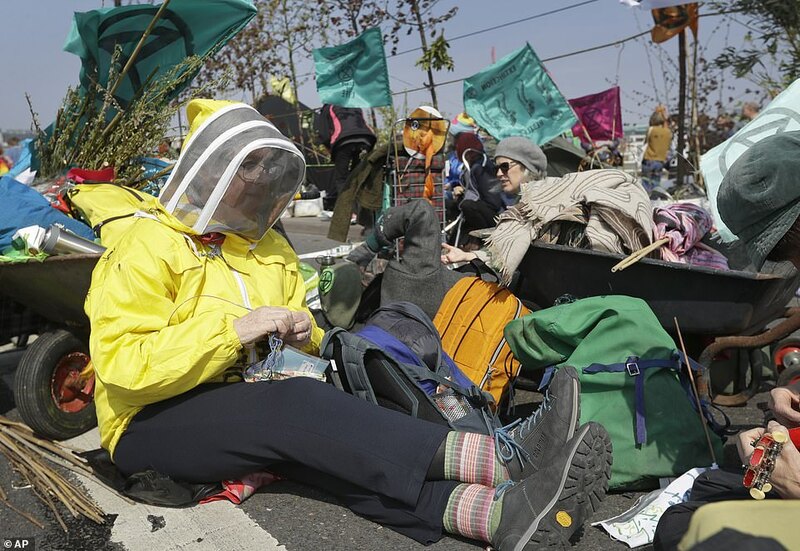 Explaining the reasons for protesting, one Extinction Rebellion member said: ‘We are just ordinary citizens and we want the council to act responsibly and save us from this accelerating disaster which may lead to serious flooding and food shortages in Scotland and across the world. 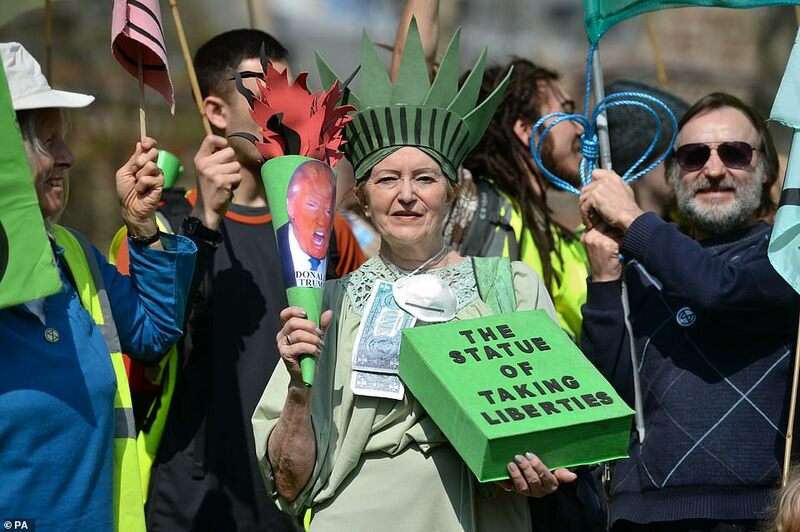 Daryl Tayar, another member of Extinction Rebellion, added: ‘I’m sure Robert Burns would’ve been happy to wear such a symbol – his poetry shows just how much he loved the environment and of course how radical his politics were. 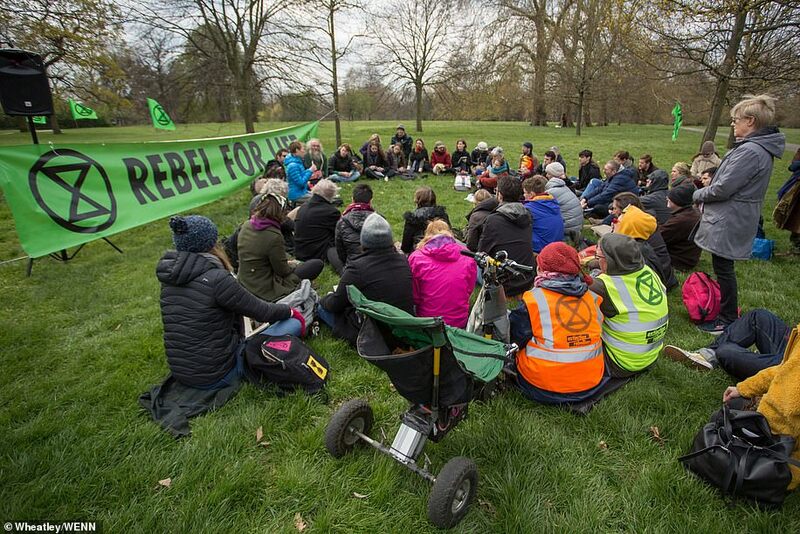 Glasgow City Councillor Anna Richardson said: ‘There can be no doubt that Glasgow, along with the rest of the world, is facing a climate emergency. 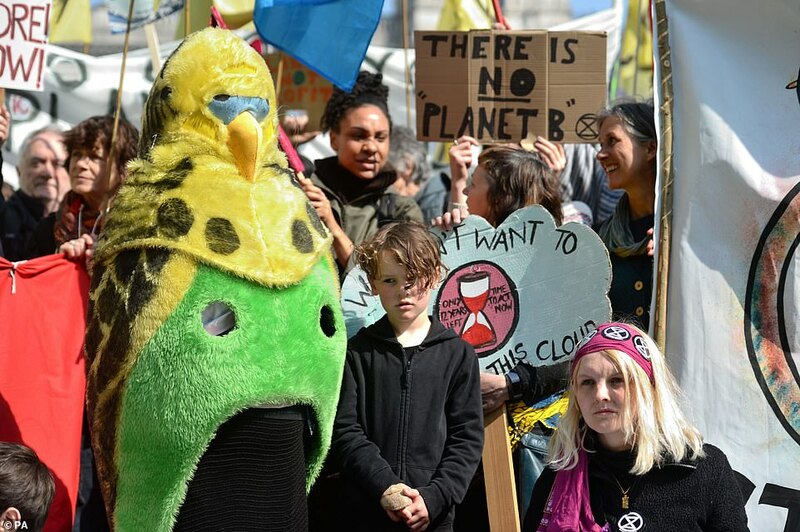 ‘The enormous challenge created by climate change is exactly why the council has set up a working group and asked for recommendations on the way forward. 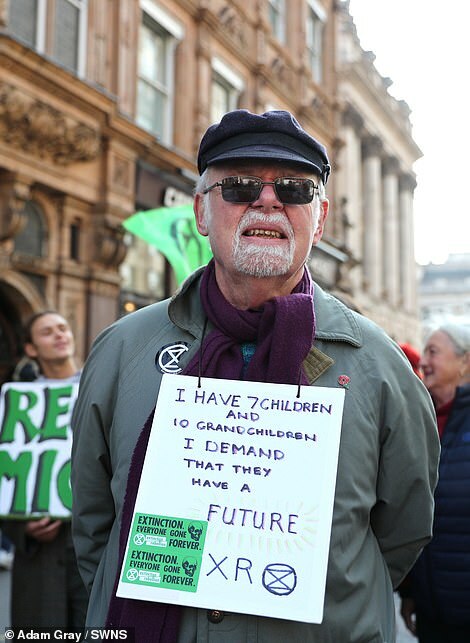 I have already made the commitment that I will act on these recommendations. 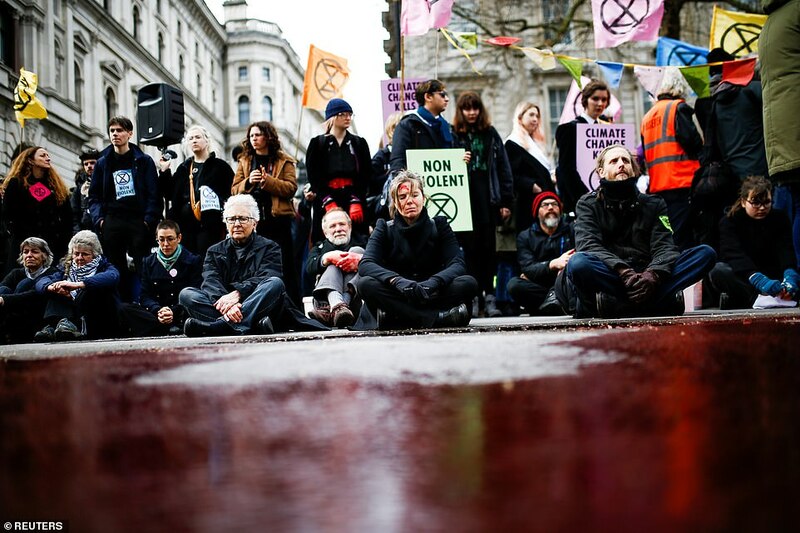 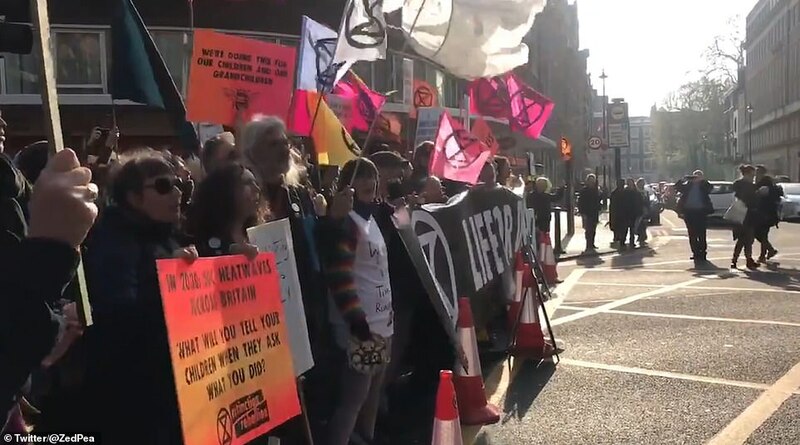 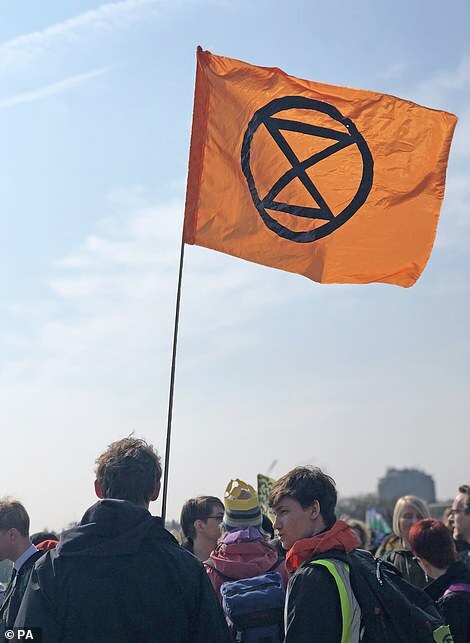 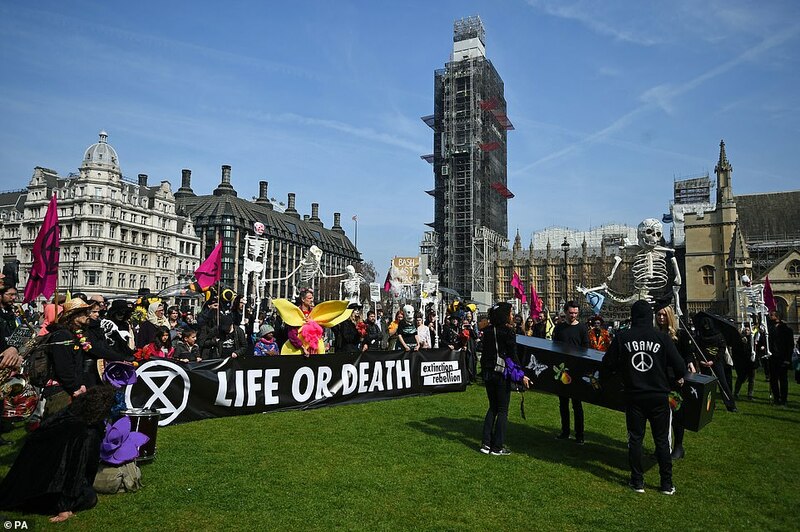 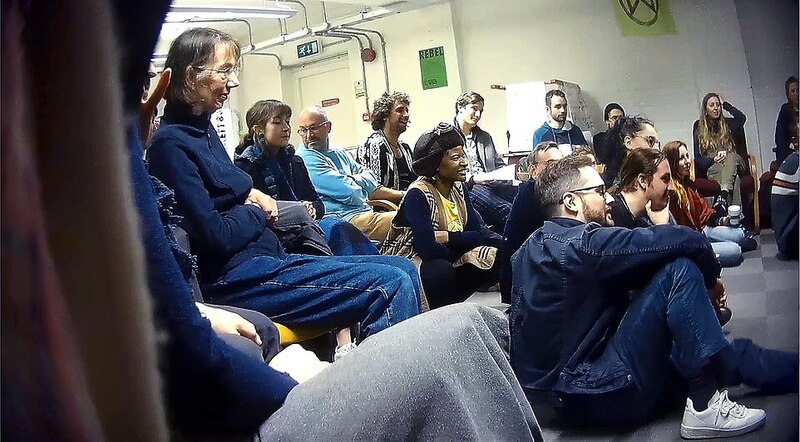 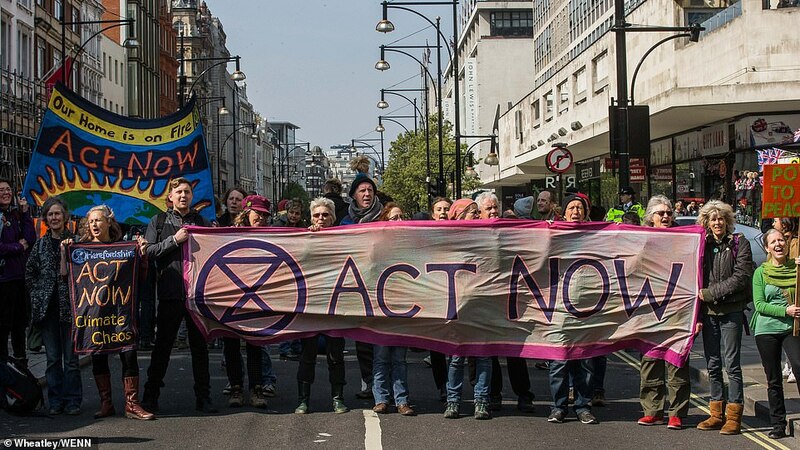 ‘Members of Extinction Rebellion are part of our Climate Emergency Working Group. 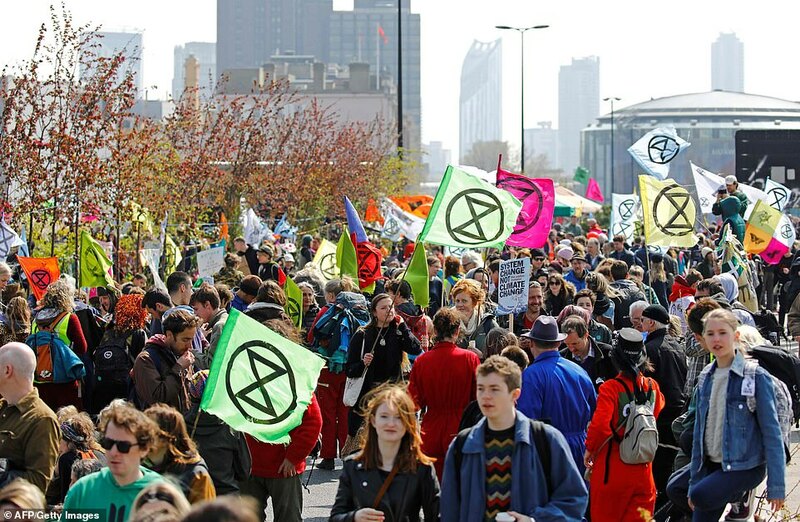 This gives them a real opportunity to contribute constructively to the debate on carbon reduction and influence what Glasgow does in the face of a global threat. 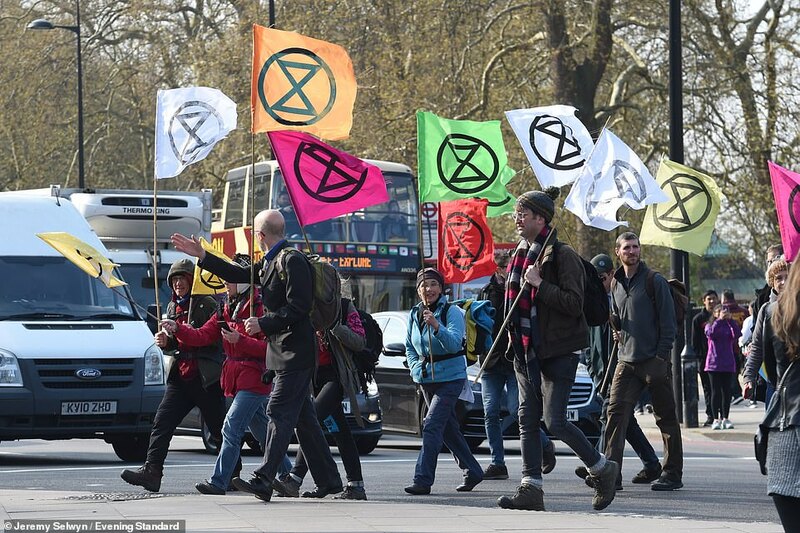 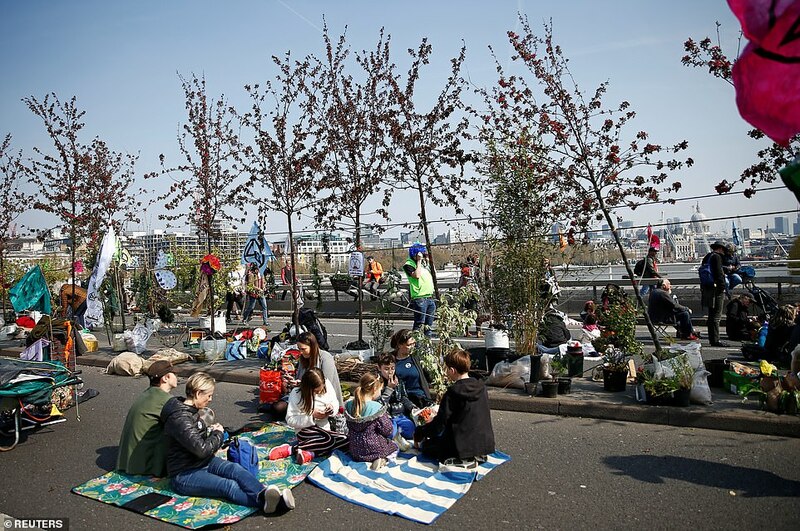 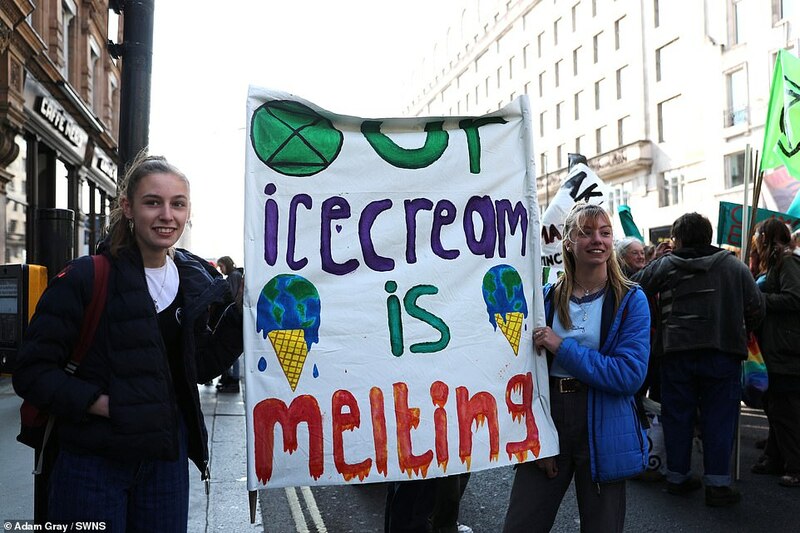 Scottish Greens climate spokesman Mark Ruskell MSP said: ‘It’s great to see citizen action highlighting the threat posed by climate breakdown. 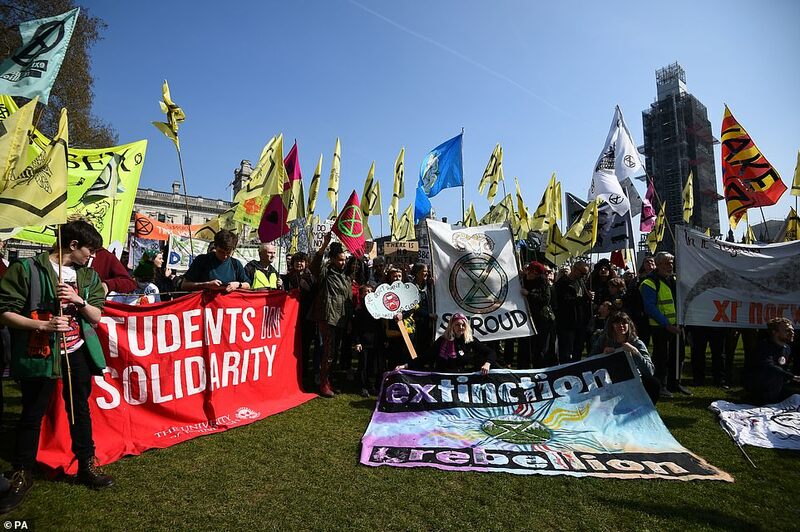 ‘Unfortunately, every other party voted against our proposal to declare a climate emergency last month in the Scottish Parliament. 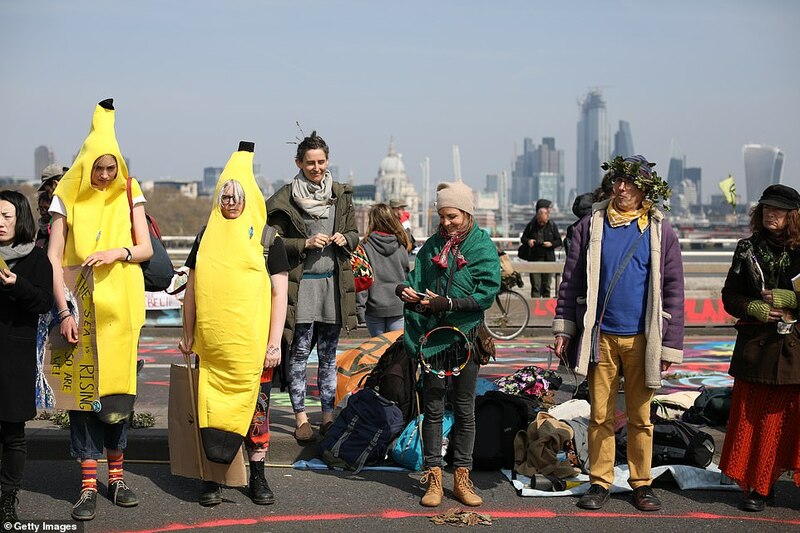 Only the Greens are willing to take the necessary action to tackle the climate crisis. 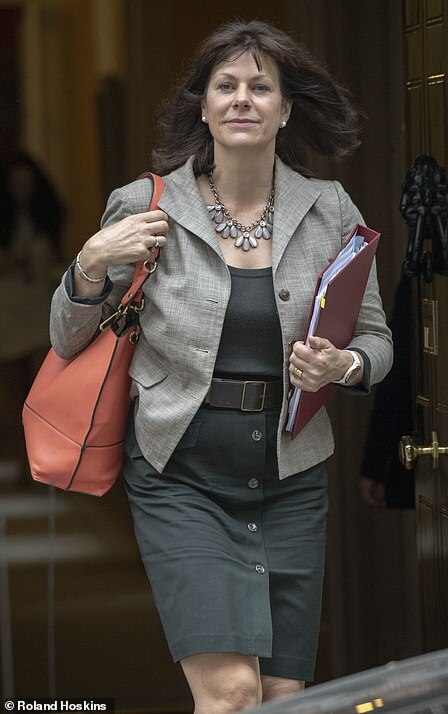 How does it feel to jump out of a plane when the last time your husband tried to murder you?